I don’t know about you, but for me, the last 2 days have been much easier. This no sugar diet is a piece o’ cake. Oh sorry. Don’t think about cake. Sure, I want to gag on every bite of unsweetened plain Greek yogurt and if I see another strawberry I’m going to run screaming into the hills. But here is what’s interesting to me: I’m really not craving sweets. I’m surprised how easy it is to avoid them. Sweetened cereals? Nope. Desserts? Not really. Sugar Free Aliens have come down and sucked the memory of chocolate cake from my brain. Should I thank them? I don’t know. I enjoyed desperately pining over desserts in a “please love me” sort of way. This no sugar diet is freaking me out. In a good way though. 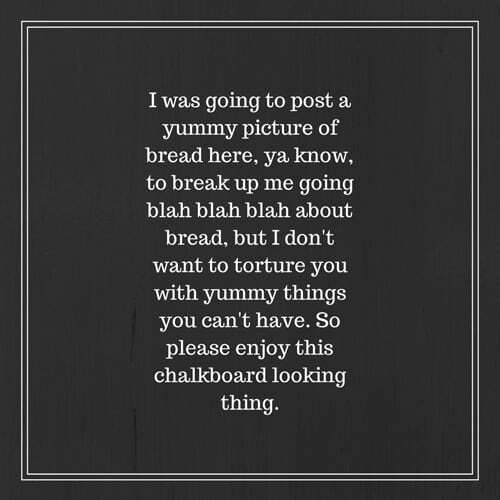 But let’s talk about bread, baby. I’m missing bread like the desert misses the rain. Don’t tell me I’m being dramatic. If I don’t get some regular bread soon I may throw myself on the ground and roll around crying like a 3 year old. Honestly though, what I’ve discovered is that the Ezekiel bread (when toasted) is not that bad. In fact, I kind of like it. [scooches down embarrassed] I know, I know – who am I turning into, right? But I actually like this sprouted stuff better than regular wheat bread you’ll mostly find on grocery store shelves. I always thought they tasted funny and now I know why: they’re loaded with chemicals. I say – if you’re going to be “bad” eat the white stuff and enjoy it! But if you want healthy, the sprouted grains actually taste better than regular wheat breads that advertise “100% whole wheat”. I’m sorry. I know I’m getting lecture-y about chemicals for someone who would happily face plant herself into a colorful sprinkle-infused birthday cake. How are you doing with the challenge? I’d love to hear from you and commiserate together! Check out my recap of Day 1, Day 5 and Day 8 of the no sugar diet. If you’d like to join us on this No Sugar Diet (a.k.a. Fed Up Challenge) check out the official rules. It’s OK if you’re starting late! Need help knowing what to shop for when you’re in the grocery store? Check out this Sugar Free Diet Shopping List. Want to know if you’re addicted to sugar and learn more about the Fed Up Challenge? Check out this.